I took my kids to Henry’s Marketplace this morning to stock up on fresh fruit and vegetables. You know it’s the middle of summer when your cart is full of fragrant white nectarines, plump honeydew melon, sun-reddened apricots and juicy plums. 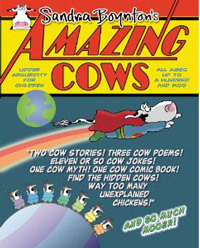 Is it me or that cow looked pretty crossed? It’s just looks like it’s telling me, don’t even think about grabbing these biscuits or else! I think my oldest can draw a friendlier-looking cow. Talking about my oldest, he’s turning five tomorrow (yikes!) so we also went to Party City to grab some birthday wrapping paper, candles and balloons. 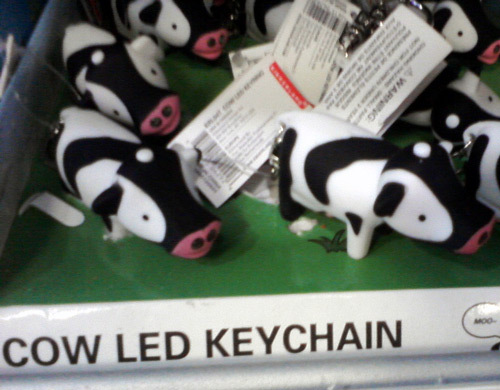 While waiting in line, we spotted another LED cow keychain, with different shape and hide patterns from the cow keychain I recently found at Michael’s. 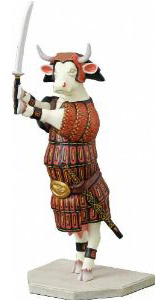 This cow’s nostrils still light up as a handy flashlight and makes a weird moo sound. Well, now you know where to get it!